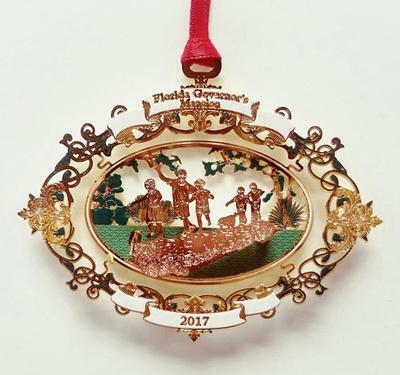 To commemorate 2017 the Governor's Mansion Foundation's collectable ornament features the Florida's Finest sculpture, the second commissioned piece of artwork for the Governor's Mansion. Depicting a game of "follow the leader", the sculpture was unveiled in 1998 and was the work of native Floridian W. Stanley "Sandy" Proctor who dedicated the sculpture to all the children of Florida. Set to captivate in beautiful 24 carat gold and proudly crafted in the USA this year's ornament makes the perfect gifts for friends, family, and business associates. Make sure to get one for yourself!